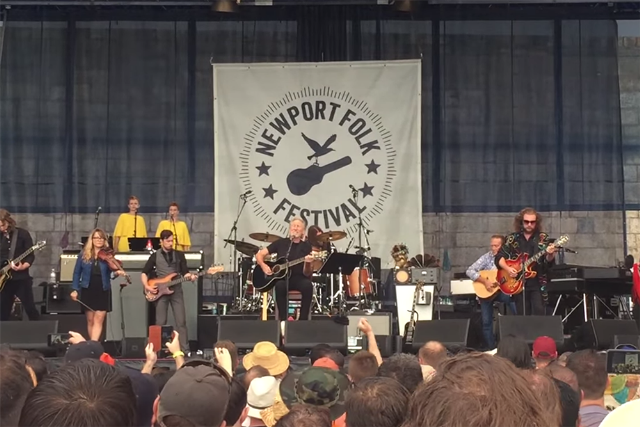 The return of Bob Dylan’s fabled electric guitar wasn’t the only thing happening at the Newport Folk Festival on Friday. Roger Waters of Pink Floyd fame — performing live for the first time since 2013 — headlined the night, and he was joined by a number of surprise guests. Newport mainstays My Morning Jacket joined Waters as his backing band following a surprise set earlier in the day. Waters’ acoustic set included a few Pink Floyd songs and a Bob Dylan tribute, along with one new track — an emotional, reflective number called “Crystal Clear” that saw him singing and sitting behind the piano “for the first time ever” in public. Lucius, Levon Helm’s daughter Amy Helm, fiddler Sara Watkins, and guitarist G.E. Smith also joined Waters on stage. Watch some fan shot videos of the performances here.